In the laboratory of biochemistry professor Tom Record, she combines superior research with a dedication to mentoring undergraduate students. Henderson has been part of the Record Lab for four years and studies RNA polymerase. Lab, such as Guanyu Liao. Photo by Robin Davies. 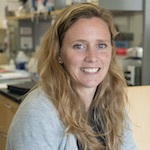 She adds that she enjoys investigating molecular details and furthering the methods that allow researchers to quantify the interactions taking place in such a huge biological system. Henderson joined the Record Lab after completing her Ph.D. in biophysics from Mississippi State University. Her husband’s military service has led to many interesting travels and experiences. After graduating from the University of St. Thomas in St. Paul, Minn. with her undergraduate degree, she was a forensic technologist. She then moved to Texas with her husband and taught high school before starting graduate school. In the Record Lab she oversees six undergraduate students. The Boyer Award is sponsored by department Ph.D. alumnus Paul Boyer, who carried out groundbreaking research in the department as a young scientist and earned a Nobel Prize in chemistry at the University of California, Los Angeles in 1997. He used a large portion of his Nobel Prize winnings to fund postdoctoral awards at several universities, including UW–Madison. Boyer passed away in June of 2018.